Keppel Shipyard is being probed by the Ministry of Manpower (MOM) over claims that its sub-contractor owes wages to its workers. The Straits Times reported on Monday how 120 shipyard workers hired by Akash Engineering and Technology almost went on strike last month. They said their employer had not paid them salaries of up to 31/2 months. 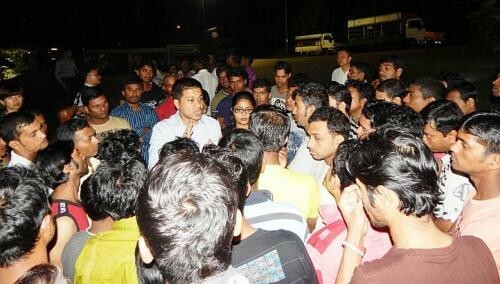 The employees - 100 Bangladeshis and 20 Indians - were talked out of their plans by the Migrant Workers' Centre. The MOM has since been investigating the sub-contractor for possible breaches of the Employment Act. Although Keppel, which is the main contractor, stepped in to pay the workers, it has emerged that the shipyard is not off the hook. "Keppel Shipyard is also being investigated by MOM for possible infringement of its responsibilities as a sponsoring shipyard under the marine sector scheme," the MOM said. The ministry said that Akash is Keppel's "resident contractor", which means that it works exclusively for Keppel. However, Keppel "is expected to extend the same level of care that they would accord their own employees", the MOM said. "This means that the sponsoring shipyard must ensure that the resident contractor complies with our employment laws and regulations, such as the timely payment of salaries and provision of acceptable accommodation, even if it means that they have to pay salaries of their resident contractor's employees." A union source said the ministry is "sending a clear signal that it holds Keppel responsible as the main contractor". It is unclear what punishment Keppel could face under the probe. The Singapore Exchange listed-company said it tried to help the sub-contractor. "From the moment we were alerted to the difficulties faced by Akash Engineering, we have made every effort possible to help them overcome their challenges," said a Keppel spokesman, adding that the company even made early payments to the sub-contractor. "Akash Engineering did not inform us of the full extent of the financial difficulties which they were facing. We have since cooperated fully with the MOM in assuring the workers that Akash Engineering from henceforth will pay their salaries in a timely manner." It is not the first time Keppel has come under the ministry's scrutiny. In 2009, four subsidiaries of Keppel Corporation were among nine shipyards slapped with 25 fines and warning letters for work safety violations after an MOM inspection. Labour MP Zainal Sapari said the MOM made the right move by probing the main contractors. "They can outsource the work to sub-contractors, but they cannot sub-contract their responsibilities on the workers' welfare."